If so much tragedy wasn't associated with this, the satirical quality would tansend all normal realms of conservation and ascend into howls of laughter at the mere mention of these idiots. You know how you can tell the GOP knows they own this war? The lengths they will go to make sure everyone knows it's getting back to "normal" in Baghdad and freedom is on the march! Watching John McCain give a press conference telling everyone within earshot things are going so well in Baghdad you can walk the streets unescorted since the "surge." Then we get the photo of him in a flak jacket with 100 armed soldiers, two Blackhawk helicopters and two Apache helicopters to make sure his jaunt to a market in downtown Baghdad was possible. Then he holds a press conference and tells everyone, "See how safe it is here?" His two GOP companions not worth a mention here claimed it was like market day in Indiana. They OWN this thing. They know it. If it wasn't for the dead, wounded and maimed, both military and civilian, the comedic factor would he enough to put someone in the hospital for laughing themselves sick. Instead, I just want to weep for those that have paid dearly for this madness. 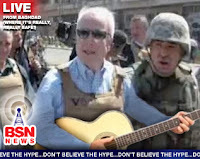 I picked up the photo from the News Blog where someone posted it after doctoring the photo and combining Bush's guitar antics on the day Katrina was wiping out New Orleans and McCain on his delusional tour with a flak jacket telling the world that Baghdad was like a Sunday stroll. How prophetic both photographs fit perfectely to show the nearly pychotic mindset these two have trying to make sure that everyone sees the surge working. Seeing this photo I'm reminded of the 1957 movie, "The Bridge on the River Kwai." In the last few moments of the film actor James Donald's character Major Clipton can't believe the events he just watched unfolding before his eyes. He's so horrified and stunned by the end of it all he can only muster the final two lines of the movie, "The madness! Sheer madness!"